In the spring of 1939 Stanislaw Sosabowski rode his horse in a large military parade down the Aleja Ujazdowksi in Warsaw. He was the commander of the 21st Infantry "Children of Warsaw" Brigade. Crowds cheered, bands played and the Polish flag of red and white was everywhere. The Colonel-in-Chief of the Brigade, Mayor of Warsaw Stephan Starzynski, stood on the saluting base as the Brigade passed. For Stanislaw Sosabowski this would be his last parade in a free Poland as four months later Nazi Germany attacked and Poland was at war. In late August 1939 with invasion imminent the armed forces of Poland were mobilised. The 21st Infantry Brigade took up position 30 miles from the East Prussian frontier. German forces attacked from East Prussia heading for Warsaw. The 21st Brigade was ordered to attack and block their advance. They engaged the enemy and held them back. Stanislaw Sosabowski requested another infantry battalion to join the fight. It was not forthcoming. They were in danger of being surrounded by the Germans so decided to withdraw to Modlin. They found Modlin almost empty of Polish troops and were told that Warsaw was almost undefended. The Brigade received orders to return to Warsaw and help defend the capital. They arrived on the 14th September and began to prepare their defensive positions. The Germans attacked the next day. On the 25th and 26th September German planes bombed in their hundreds. Warsaw was ablaze. A surrender of Polish forces was negotiated: soldiers and NCOs to be released home and Officers to be sent to POW camps. 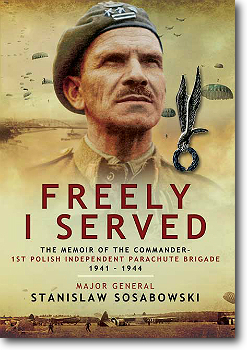 In early November 1939 Sosabowski, with the help of Polish scouts, managed to escape from German captivity. He returned to Warsaw and made contact with the Underground Movement. Colonel Rowecki, Underground Chief of Staff, ordered Sosabowski to go to Romania to collect government funds. Sosabowski successfully made it to Hungary where he made contact with the Polish Embassy. There his orders were changed. He was now to go to France and report to Polish Prime Minister and Commander-in-Chief General Sikorski in Paris. On 20th December he flew to Milan and from there took the sleeper train to Paris. Sosabowski was the first senior officer from occupied Poland to report to General Sikorski. He was appointed Deputy Commander of the 1st Polish Division. Later he became Deputy Commander of the 4th Infantry Division. On 10th May 1940 Germany attacked France. Sosabowski escaped from France on a British collier, the Alderpool, which left the port of La Rochelle with over 3,000, mostly Poles, on board. The ship docked in Plymouth on the 22nd June and the Poles were sent by train to Glasgow. The Polish forces initially setup camp in Biggar, Lanarkshire, then moved to Eliock (Kirmanoch) and in October 1940 to Fife. There they guarded a sector of the east coast of Scotland from possible German invasion. On 23rd September 1941 General Sikorski was invited to Scotland to witness the biggest Polish parachute exercise so far. At the end of the exercise the men paraded and General Sikorski announced that they would now be known as the 1st Polish Independent Parachute Brigade. The members of the Polish Parachute Brigade had a great desire to have military colours made for them in Warsaw. Sosabowski spoke to Captain Kalenkiewicz before he left on a mission to occupied Poland about the possibility of getting colours made and smuggled back to Great Britain. Captain Kalenkiewicz made contact in Warsaw with Mrs Zofia Kossak (a famous novelist) and a Mrs Maria Kann. The two women organised a collection in Warsaw and a competition was held to find a design for the colours. Cloth was obtained by using the crimson robe of an 18th century church dignitary. Seamstresses who embroidered military flags took almost a year to complete the colour. The problem was how to get the colour to Great Britain. Its hiding place was changed many times until it was sewn into the cassock of a priest which hung in the Church of the Grey Sisters until the spring of 1944. The colour was flown to Britain during an operation to get five important people out of Poland. The colour was handed over to Sosabowski on 29th April 1944. On 15th June 1944 the entire Polish Parachute Brigade paraded at Cupar, Fife. Watching was the Polish President Raczkiewicz and the General Staff. A priest blessed the colour and the President then presented the colour to the Parachute Brigade. The British were eager to use the Polish Parachute Brigade for operations in western Europe. On 6th June 1944 General Sosnkowski the Polish Commander-in-Chief (in succession to General Sikorski) wrote to British Army General Grasett acceding to the Britsh request and placing the Brigade at the disposal of the Supreme Commander (Allied Expeditionary Forces). The Polish Parachute Brigade though was now under British command and the long held Polish desire for the Brigade to fight in Poland for its liberation would never be fulfilled. In september 1944 the Polish Parachute Brigade took part in Operation Market Garden an attempt to sieze and control bridges in the Netherlands. Three airborne divisions, one British and two American, together with the Polish Brigade which would support the British at Arnhem were parachuted into the Netherlands. The intention was to bring the war in Europe to an end in 1944. The Polish Parachute Brigade was due to leave for the Netherlands on D-Day + 2 (19th September) but due to bad weather they did not leave until the 21st September. Their original landing zone was changed to a drop zone near the village of Driel. After landing they found that the ferry which would have enabled them to cross the Lower Rhine and join the British had been destroyed by the Germans. The British said they would bring rafts which would enable the Brigade to cross. Two British officers crossed the river in a dinghy and explained that the situation north of the Rhine was critical. They offered small three man rubber dinghies to aid in crossing the river. That night the Poles managed to get 50 men across but only one dinghy was left undamaged and the Polish 8th Parachute Company suffered heavy casualties. The next night over 200 Polish soldiers made it across the river. A further attempt to cross the Lower Rhine was made by the 1st Battalion Dorsets. The decision was taken to evacuate the British and Polish forces from the north bank of the river. General Sosabowski gave the order for the Polish Brigade to evacuate Driel and head for Nijmegen. The Battle of Arnhem was over. The Polish Parachute Brigade returned to Britain in October 1944. On the way back Sosabowski saw a newspaper article which said General Sosnkowksi had been dismissed as Polish Commander-in-Chief. The Russians hated him. He had been a great supporter of the Parachute Brigade. Three months later Major General Stanislaw Sosabowski was also dismissed. On 1st December British General Browning had written to the Deputy Chief of the Imperial General Staff suggesting that he be removed from his command. The reason given that Sosabowski was too difficult to collaborate with. Publisher Pen & Sword Books 2013. First published in UK by William Kimber 1982. This page was added on 21 September 2015.